When I returned home from my two-week whirlwind trip to Europe I was repeatedly asked what my favourite part was. Easy – it was the 24 hours I had in San Sebastián with The Spaniard. San Sebastián, or Donostia in Basque, is a coastal city just 20 km from the French border is famous for the culinary scene featuring a high concentration of Michelin Star restaurants. After saying goodbye to my Belgium friends in France I took three trains over 7.5 hours to get to San Sebastián where I met up with The Spaniard, who had to drive 200km from his hometown of Santander. We dropped our bags at our Air B&B apartment in the old town and our host provided us with a map and his recommendations of restaurants to visit. On my first two visits to The Spaniard’s hometown I had been in many places where pinchos, or a small snack, was available on plates on the bar; however, San Sebastián was a whole new experience. Walking along the pedestrian streets in the old town – everywhere we turned the bars were lined with plate after plate of pintxos. Our first stop on our self-directed pintxo tour was at Ttun-Ttun Tabernas, which happened to have the largest assortment pintxos on display. We found a server who helped identify the gluten free options, but explained that they had gluten free bread in the back and I could order a dish I liked the look to be made in the kitchen. I decided to pace myself and have a piece of revuelto de cordero (lamb omelette) and some pulpo a la gallega (grilled octopus with paprika). In contrast – The Spaniard piled his plate high with assortment of gluten-filled bites. As we were munching down a gentleman walked by and gave The Spaniard a thumbs up. We both looked confused and he came back to say he was from Toronto and approved of The Spaniard’s ‘Blue Jays’ t-shirt. Our next stop was Gandarias, which had smaller yet even more appetizing selection of pintxos on display. Ordering a la carta seemed to be more popular here as the barmen were busy handing out drinks and dishes from behind the bar. Gandarias actually had a gluten-free menu – so I ordered a serving of mushroom risotto and a bacon-wrapped scallop with roasted red pepper (on gluten free bread). We also shared the beef cheeks which didn’t have the most exciting presentation but were absolutely delicious! We attempted to squish our way into La Cuchara, where Canadian Eugenie Bouchard was on the TV playing in the Roger’s Cup; however, the server said everything would be contaminated for me so sadly we left. We were pretty full so we decided our final stop of the night would be Atari Gastroteka. As we were checking out their a la carta menu a barman asked if we needed help and we explained the celiac situation. He said they had lots of options and even went back to the kitchen to double check on a few dishes. I was so happy we stopped in because I absolutely loved the revuelta de bacalao (salt cod omlette) and cochinita (pulled pork). The Spaniard opted for an extra bite of cod in a gluten-filled sauce. I busted out enough Spanish and a smile to get an order of creme brûlée at Atari before the kitchen closed. We were both stuffed – thankfully we only had to waddle a few blocks back to our apartment. I learned the Old Town in San Sebastian is loud at night – but the location was well worth it. The next morning we made it less than two blocks from the apartment before The Spaniard was lured in by the smell of fresh baked pastries. Why have one pastry for breakfast when you can have two? We walked around the beautiful bay and took the funicular up for a better view of San Sebastian. After walking for hours we found our way back to the old town where we stopped in a Borda Berri for a snack. Instead of lining the bar with pre-made bites, patrons had to order all dishes directly from the bar. The woman we ordered from totally got the gluten-free options and made sure the bread for the foie gras came in a basket instead of on the plate. That could have been enough for lunch, but I wanted to max out our dining experience in San Sebastián, so we went in search of a set menu lunch. We decided on La Cepa, which had a 3 course menu for 18 euro each and including wine, because the server basically shouted Of Course! (por supesto!) at us when we asked if they could accommodate celiacs. Along with my first course, a seafood risotto, I got a gluten free baguette which came out hot and wrapped in foil. For our mains, the Spaniard settled on pierna de cordero (grilled lamb) while I indulged in another serving bacalao (cod). For dessert I had the creme caramel while The Spaniard opted for the gluten-filled apple tart. Sure, the presentation of our meal wasn’t as fancy as the one Michelin star restaurants we went to on my last two trips to Spain, but at 18 euro a person the price was right and the staff were wonderful. After our late lunch we picked up our bags and walked to the car. In total, we had just 24 hours, but I think we made the most of it. 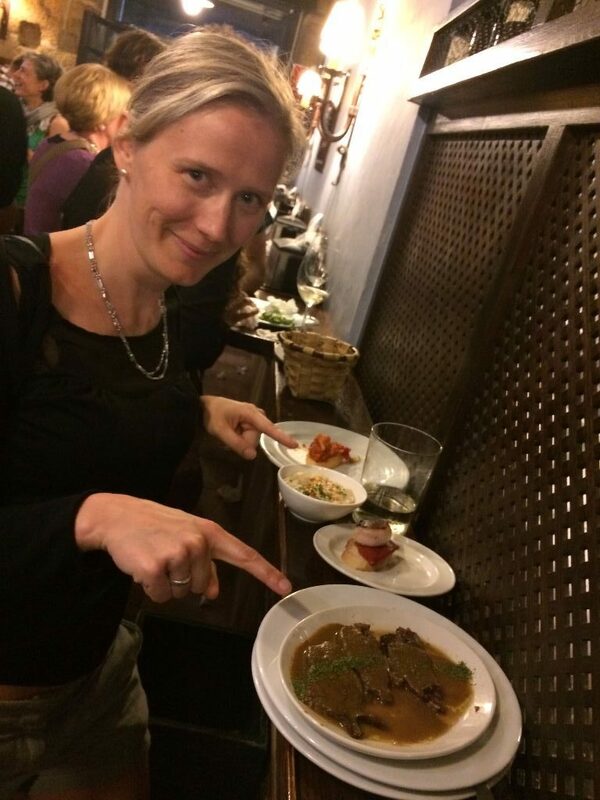 I had just a taste of the gluten-free options in San Sebastián – I can’t wait to go back for seconds. and special diet needs. Thanks for sharing this!! !